You are at:Home»News»Marketing»A trigger in demand? 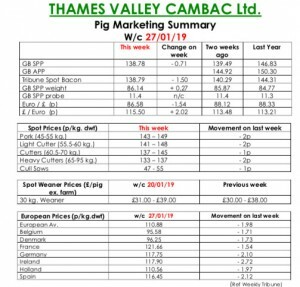 This week’s Pig Marketing Summary from Thames Valley Cambac, reported that trading see’s the back of January, and it is hoped that most cash strapped households will have a pay packet by the end of the week. This may in turn, trigger a touch of demand, which was described by most processors as awful. It was frustrating that some processors continued to short kill, meaning that a backlog is starting to form amongst their supply base. Demand and contract price contributions continued to fall, down between 1p and 3p. Supply was ample for demand, although future growth rates may be tempered by the recent cold snap. There was little difference in sentiment in the fresh meat market, with minimal foot fall on the high street causing poor sales. The cull sow market eased back a penny due to currency. European markets were stand on across the board but quotes in sterling were tempered as the Euro continued to weaken , down over 2p, to end the week at 86.58p. The Weaner Marketing Summary, for week commencing January 20, reported that demand improved slightly, albeit from a very low base, with an odd fresh enquiry here and there. Supplies remained tight, however, with some producers indicating of lower numbers to come in the near future. 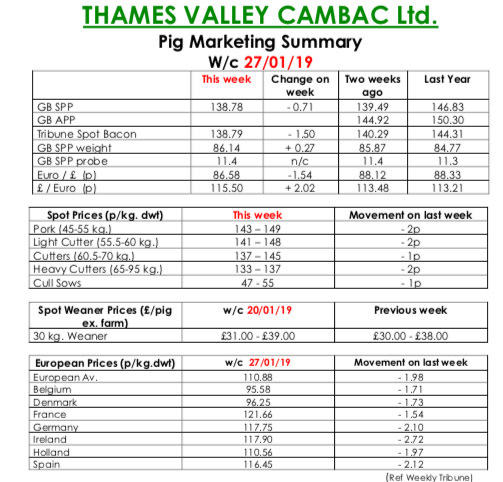 The prices announced by the AHDB saw the weighted average for 30kgs stores fall by £3.68 to £43.91, and the weighted average for a 7kg weaner fall by £1.40 to £35.56.